Ocean Choice International, NF, locked out trawlermen on Feb. 8. The RCMP were brought in to ensure that company scabs could board OCI’s groundfish trawler the Newfoundland Lynx. Now, in the Parliament and in a series of articles in the media, the extent of the damage being inflicted by the Harper government is being revealed. Langer said he was told the change would be included in upcoming federal omnibus legislation following the March 29 budget. The current Fisheries Act bans activity that results in the “harmful alteration, disruption or destruction of fish habitat.” The new wording includes numerous exemptions to give the minister “or a person prescribed by the regulations” the authority to allow an “adverse effect” on fish considered of value. Langer said the “subjective and ambiguous” new wording would make the law extremely difficult to enforce. 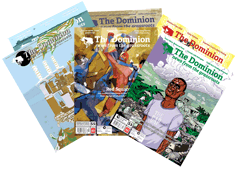 “For instance, what is a fish of economic, cultural or ecological value?” he asked. The note said the legislation’s habitat protection provisions are “one of the most frequent triggers” of federal assessments under the Canadian Environmental Assessment Act (CEAA). According to Postmedia, among the representatives of the monopolies raising concerns about the Fisheries Act are: the Canadian Association of Petroleum Producers, the Business Council of BC, the Canadian Electricity Association, the Canadian Hydropower Association, EnCana Corp., Teck Resources Ltd., the Mining Association of Canada, the Canadian Energy Pipeline Association, the Council of Forest Industries, and the Saskatchewan Power Corp. In October 2011, writing in iPolitics, Michael Harris reported on the significance of cuts to funding at DFO as part of the Strategic and Operating Review and how this is affecting monitoring of the fisheries. “Last week news broke that the DFO, was planning to cut its scientific budget for fish stock monitoring. Sadly, that in itself is not news. 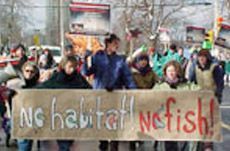 “But what is noteworthy about DFO’s new planned cuts is that they affect the scientific monitoring of fish stocks. According to DFO flaks, the department can satisfy Treasury Board’s demand for cuts without threatening the stability of fish stocks – an epic absurdity even for the trained-seal bureaucracy serving Stephen Harper. Harris explains the significance: “The key word here is ‘multi-species.’ Under DFO’s new plan to save $17 million and cut 275 jobs, quotas for individual species will be established not for one, but for three to five years. The result is that the industry will be fishing valuable species more while Ottawa counts them less. It is even possible that DFO may not be conducting multi-species surveys at all in the near future. “Industry has always had its thumb on the scale when it comes to setting quotas, partially by Ottawa’s practice of using commercial catch rates to ‘tweak’ DFO’s own stock assessments, and partially by good old fashioned political blackmail. Quota means jobs both at sea and ashore, and quota cuts bring the politicians unhappy voters and higher social welfare costs. 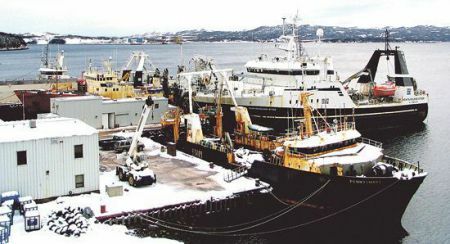 Various provinces and independent and small fishermen are raising alarm at government moves to get rid of fleet separation policies that prevent the same company from carrying out fishing and processing. 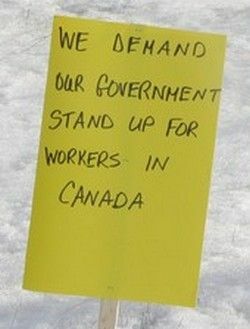 On March 5, the Fish Food and Allied Workers of the Canadian Auto Workers issued a statement raising serious concerns over the direction the Harper government is taking. “Fishermen’s organizations from across Atlantic Canada say DFO is opening the door to the elimination of Canada’s independent fishermen and moving to de-regulate the Atlantic fishery,” the statement said. “Representatives of thirty-three (33) owner-operator fleets from Quebec to Newfoundland say the Department has shown nothing but contempt for fishermen and their organizations by launching a top-down, centrally controlled and manipulative policy process without any notice. “The inshore and mid-shore owner-operator fleets in Atlantic Canada land more than 75 per cent of the value of Atlantic fisheries through their control of lobster and crab fishing and their majority share of the shrimp fishery. Under government policies in place since the early 1980s licences to these fisheries are restricted to individual fishermen who must own and operate their own vessels. Fish companies have been trying to gain access to these licences for years. On March 14 in the Parliament, Liberal MP Lawrence MacAulay exposed recent developments in the Great Lakes fishery. “[L]ast year purse seiners were unable to catch all of the remaining herring in the Gulf of St. Lawrence. Now we are hearing that the minister has cut a deal to allow massive corporate mid-water trawlers to fish in the Gulf of St. Lawrence. On March 14, NDP MP Jack Harris presented a petition in the House of Commons from residents of St. John’s and other parts of Newfoundland and Labrador who are opposed to the decision to close the marine rescue coordination centre in St. John’s. The centre provides important services to the small communities and fishermen of the region. “They are concerned that the government needs to understand and acknowledge that the closure of the centre will mean the service will suffer and lives will be put at risk,” Harris stated. “This search and rescue centre in St. John’s is responsible for 900,000 square kilometres of ocean and 28,000 kilometres of coastline, and that is just in the Newfoundland and Labrador region. This is a big and important country and we need to protect our citizens. These rescue coordinators have local knowledge of the coastlines, of the people involved and of the dialect and language that has been spoken. It is very important that this rescue centre be kept open. The petitioners so ask this honourable House,” he added.